In a very limited sense, I have dabbled in homebrew for a long time; my first experience was at university. I bought one of those homebrew bags from Boots, which was basically a 20 litre sack prefilled with – well, I don’t know what, some sort of kit goo I suppose. You just added boiling water, shook it up, emptied the yeast sachet and waited. I don’t recall how it tasted, but I do remember it not lasting very long and a distinct increase in visitors to my room while it was there. Since then, I’ve worked through a few extract kits – tins of dehydrated wort where you just add boiling water, add your yeast and wait. That’s fine as far as it goes, but I’ve never been entirely convinced it was worth the effort – the results always tasted like homebrew and it frankly felt like I was cheating. It felt like using a shop bought cake mix, where you “just add eggs”. So last year, I turned 40 and had the traditional series of people asking what I wanted for my birthday. 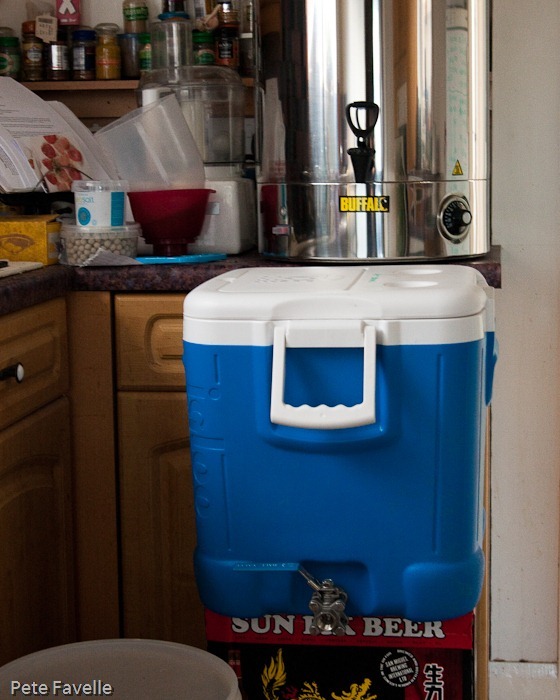 Having established that “a night with Kylie” wasn’t on the table, option two was buying some proper brewing kit in the form of a tea urn (which is much easier to use as a boiler than the old stock pot I was using up to that point, not least because it has a tap) and an icebox. 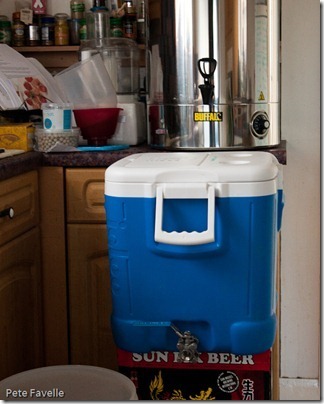 The icebox, of course, isn’t just an icebox – it has a tap and a grain filter built into it, and works as a very good mash tun. It will hold a batch of grain and hot water for 90 minutes and barely lose a degree of temperature, and then you just turn the tap and the wort flows out. Suddenly doing “proper” brewing, starting from the grain and doing everything a grown up brewery does, became possible. The rest of my kit is a slightly more traditional mix of leftovers and homebuilt. Several years ago Boots were selling off all their old beer kits and I got three full kits – each including a big fermenting bucket – for a pound each. My Patented Mash Tun Support Structure is, err, two boxes of Sun Lik Beer stacked on top of each other. 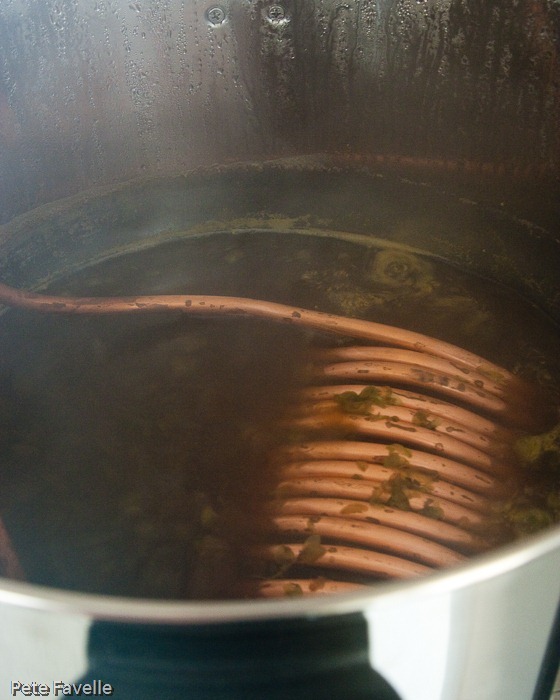 The pinnacle of my equipment is, of course, my immersion cooler which is several yards of copper tubing which I wrapped around a demijohn and turned into a coil just the right size to sit in my tea urn. 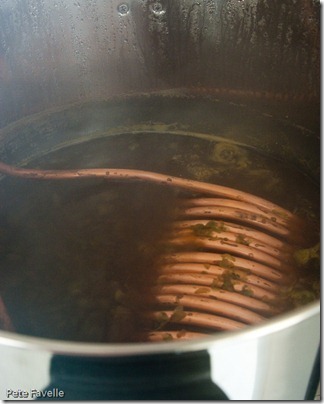 With cold water running through it, it can drop a boil down to a yeast-friendly temperature in half an hour or so. So I was all set to do some real brewing. And despite my trepidation, it turns out that brewing really isn’t that scary. If you can make tea, you can probably brew – after all, that’s pretty much what you’re doing in the mash tun. I’m not suggesting that you’ll be producing perfect beer from day one, but despite all my mistakes (and there are plenty of those!) my very first all grain beer is still the best beer I’ve ever made – and more importantly, tastes more like beer than homebrew. For now, I’ll leave you with some of the more important things I’ve discovered so far. No, really. If you’ve ever done any sort of extract brewing and made a cup of tea, you’ve already mastered every stage. Yes, you need to either buy or MacGyver up some sort of mash tun but it really is way, way easier than I expected. On one hand, brewing is a wonderfully simple sport. You soak grains in some hot water, then add yeast and wait. But, much like photography, there are a million and one cool little gadgets you can waste your money on to satisfy your geek lust. My current favourite is my awesome refractometer which I got from Ebay for 15 quid – way better than a crappy old hydrometer. I live in London. My water is horribly hard. I have now bought a kit to test the hardness and pH and it’s almost off the scale. And yet despite doing absolutely nothing to my water for the first brews, I made drinkable beer. As I’m getting more into it, I’ve bought a testing kit and some brewers acid but that’s because I’m a geek. As you will see in my next homebrew post, my first brew went properly wrong, appeared to stick half way through fermenting and sat in a bucket with me swearing at it for a month. It still tastes like beer. I know it’s all technically wrong, but it’s still nicer than plenty of beers I’ve had to pay for in pubs. I love your blog. Now that’s out of the way I’d like to ask you if you bought or made the mashtun? Homebrewing isn’t very big in the Netherlands and I haven’t been able to find something like that ice box you have. In the end I bought it pre-converted from The Malt Miller – however it looks like he no longer lists it. It’s based on an Igloo Ice Cube, but again it looks like Igloo have discontinued the version which had a drainage hole (which obviously makes conversion a lot easier). To be honest, if I was starting again I would look for (or build) a mash tun with a false bottom rather than the copper piping I have, simply because it would be a lot easier to clean! I found some bins in the web shop where you ordered the filling pipe thingy from. Those seem to be made from proper ice bins. If I wanted to create one, would that be hard or is it just buying a good bin and fitting a false bottom? Of course, I’d buy one with a drainage hole. How fine would the mesh have to be, you think?